Clogged drains are unexpected, frustrating and never welcomed. When a clogged drain is affecting the flows of water in or out of your home, we’d like to have a magic wand to so they unclog instantly, and we can resume our lives without issues. This “silver bullet” desire is a common trait in all of us may be exploited when marketing many consumer products. Take a pill to lose weight, use this cream to stop aging, do this one minute exercise to achieve a taut body… liquid drain cleaners, unfortunately, may fall into this category. You see them with reassuring text on the container like “Max Gel,” “Heavy Duty,” “Green Gobbler,” and “Pro-Strength Full Clog Destroyer plus PipeGuard.” It’s a brilliant idea: Buy a bottle, pour it down the drain, problem solved. If only it worked! You may be one of the countless people who have tried a liquid drain cleaner with zero results – it is not uncommon. The catch is, liquid drain cleaners may be effective in some rare cases – usually for very minor clogs. However, in every case where Drano or Liquid Plumbr has gotten results, you most likely could have done the job yourself faster, at less cost, and much more safely. How Does Drano and Liquid Plumbr Work? Except for salt, these ingredients are highly toxic to humans. Sodium nitrate is a known as “probably carcinogenic” if ingested by humans. When you pour this solution down the drain you unleash a series of simultaneous chemical reactions. The lye reacts with aluminum in water to create heat at a near boiling temperature. Lye breaks down organic matter and in a hot environment, the decomposition is accelerated. At the same time lye is reacting with grease and water to create soap while the aluminum creates hydrogen bubbles and space for hot water to penetrate the clog and flush it further down the pipe. This is the theory behind liquid drain cleaners. The truth is that for every time a store bought liquid drain cleaner works to unclog your sink, a little baking soda, salt, vinegar and hot tap water would have probably worked as well – and is not toxic! Are Liquid Drain Cleaners Safe To Use? We believe that if you can solve a clog yourself, you should give it a try. For DIY solutions for minor plumbing issues, our team at Benjamin Franklin Plumbing wants to help you do it right. 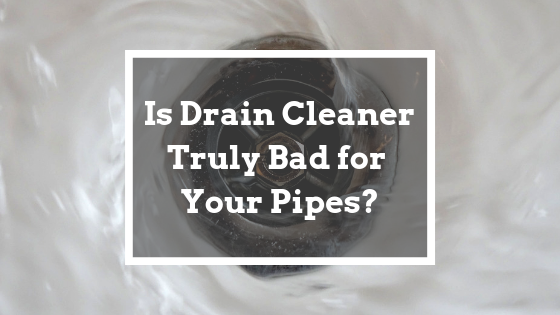 In many cases, liquid drain cleaners are capable of damaging pipes and toilets. These drain cleaners sit in pipes and generate more heat and chemical reactions than some pipes were designed to withstand. They react with corrosion that already may exist in your pipes and they can do so in an unpredictable way. They can create cracks in joins and old pipes and over time can cause PVC pipes to break. Clogs happen. This means that if Drano is your go-to solution, you are using it again and again over time and the negative effects accumulate. It can dissolve the glue that holds PVC pipes together. These cleaners are not designed for frequent or even regular use. The generated heat can crack a toilet or create fractures that later cause leaks that may be traced back to Drano use. Unpredictable chemical reactions. Drano is a chemically active agent that may sit in your sink or toilet traps and react with cleaning chemicals to create toxic fumes. In the kitchen, it could be unsafe to use strong chemicals around food and family. The fumes are disruptive to your immune system. Drano is caustic and can splash back at you, burning skin and create serious eye injury, including blindness. Due to the chemical reaction of hydrogen bubbling, air pockets can form that can cause blow-back up the pipe, putting any person nearby at risk of serious injury. Drano and Liquid Plumbr are not environmentally friendly. The waste water with liquid cleaner chemicals can leech into ground if there are even small cracks in the waste line. The toxicity can affect organisms in the ground and tree roots. The bottles you throw out end up in landfill, damaging the environment further. Use a plunger. A flat bottomed plunger is appropriate for tubs and skinks and a tapered bottom plunger for toilets. Create the tightest seal you can to increase the force of the water you are driving down through the clog. This will force the clog to move and change shape until it enters a larger diameter pipe and can flow away freely. Use a snake or pipe auger. If the clog is within reach, this device can access and break up the clog so it can move along and out of your system. Pour hot boiling water down the drain followed by a half cup of baking soda. Let it sit for a few minutes. Then pour one cup of vinegar mixed with one cup of boiling water down the drain and cover the drain opening. Let it sit for ten minutes. Final flush with a pot of boiling water, or several. Watch what you put down the drain and ensure your family does too. Only allow water down your drain. In toilets, only organic waste and toilet paper. Except for toilet paper, paper products clump in water. Even products called “flushable” can clog your drain lines. Keep all drains covered with drain guards. All grease from cooking should be thrown into the trash. Grease is the worst thing you can put down a pipe because it cools and hardens when it gets deeper into the plumbing system. Garbage disposals are not for garbage. They have a very limited ability to grind food to safely let water carry it away. Additionally, many foods are fibrous and are clog prone. Only wash small bits of food off plates to grind with your garbage disposal. How Do I Unclog a Shower Drain?